This is a Sales Time Management article from guest poster Dave Kahle, author and leading sales educator. Effective sales time management is the greatest challenge facing sales professionals. The rule is this: When you give a proactive sales person “other stuff” to do, the other stuff will always expand, taking more in time and energy than you anticipated, and rendering the proactive sales efforts to an unacceptable smaller part of the person’s labors. Presto. The problem is solved. But, alas, the couple of hours a day turn into a half day, and sometimes more, as the sales person gets caught up in reacting to the inbound calls. Those proactive sales calls that should have been made in that time are never made. The silent costs of that decision and the inevitable “Other Stuff Expansion” begin to be felt months down the road. Or, you have a sales manager check out that promising new product line, or write that new procedure because he/she “understands that,” and, of course, you’re too busy. Or, you have inside sales people who also answer the phone and respond to inbound calls, and you are constantly frustrated that they don’t make enough outbound calls. The example can go on and on. A quick perusal of your sales efforts will unearth dozens, I’m sure. There’s a simple explanation for this. Making proactive sales calls is a high risk effort that requires initiative, motivation and self-discipline. In other words, it’s hard to do. That’s one of the reasons why most people aren’t sales people. On the other hand, taking care of “other stuff” is usually low-risk, easier and somewhat fulfilling. And, it keeps you busy. That’s why, “When you give a proactive sales person “other stuff” to do, the other stuff will always expand, taking more in time and energy than you anticipated, and rendering the proactive sales efforts to an unacceptable smaller part of the person’s labors. “ It’s the law of OSE. In a bigger picture, OSE for sales personnel is just the specific application of a deeper rule. That rule is this: When you give someone something to do, you are, by that act, preventing him/her from doing something else. Or, to be more personal, when we accept the responsibility for doing something, we, by that action, eliminate the possibility of our doing something else. What sounds blatantly obvious is open reflection, so often violated that it has become one of the major productivity killers, and one of the most common mistakes made today by managers and self-managers of all kinds. a. If you have given, or are tempted to give, anyone who has proactive sales responsibilities, other things to do – don’t! There is always a greater cost than meets the eye. If you are a salesperson who has other stuff to do, try to hand it back to your manager or pass it on to someone else. b. OK, you can’t do that. For whatever reason, your sales personnel must also do other stuff. Plan B. Keep the division between the two sets of competing responsibilities as clean and sharp as you can. So, the other stuff should be well defined, have clear guidelines for completion, and be limited to a specific period of time. By keeping the divisions clear between the competing responsibilities, you limit the damage done by other stuff expansion. In the long run, it’s those organizations and individuals who focus on the core tasks and don’t diffuse their efforts who succeed. Dave Kahle has trained tens of thousands of B2B sales people and sales managers to be more effective in the 21st Century economy. He’s authored nine books, and presented in 47 states and eight countries. His latest book, Eleven Secrets of Time Management has just been released. Sign up for FREE sales course at The Sales Resource Center.com, as well as the free weekly Ezine. 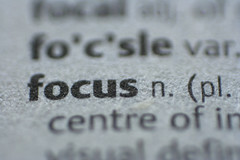 Image “Focus” by ihtatho on Flickr under Creative Commons license.